BE SURE TO CHECK OUT THE "STRAWBERRY BLOG" FOR ALL THE LATEST NEWS! Welcome to the official home on the web of Landry-Poche Farms! We're excited that you've visited our site and we sure hope you'll take a few moments to look around. 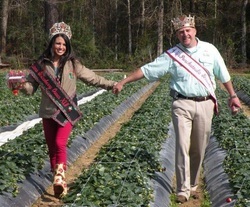 Browse through the site and read about our rich history and about all we do during the strawberry season! We want to thank all of YOU out there who visit our farm yearly and buy our berries...without YOU, we wouldn't have been around for the past 88 years! We love our community and we're here because of you!! Make sure to visit our official Facebook and Twitter pages via the links above...we love having new members in our online community as well! !